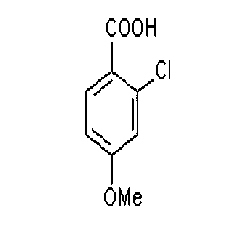 We are one of the prominent trader and suppliers of broad assortment of 2-chloro-4-methoxybenzoic acid. These are manufactured in accurate compositions using best quality chemical. Our range is appreciated by our clients for its superior quality, non-toxic features and effectiveness. The range finds its application in various industries such as chemical, research institutes and such others. Further, our clients can avail the range at market leading prices.